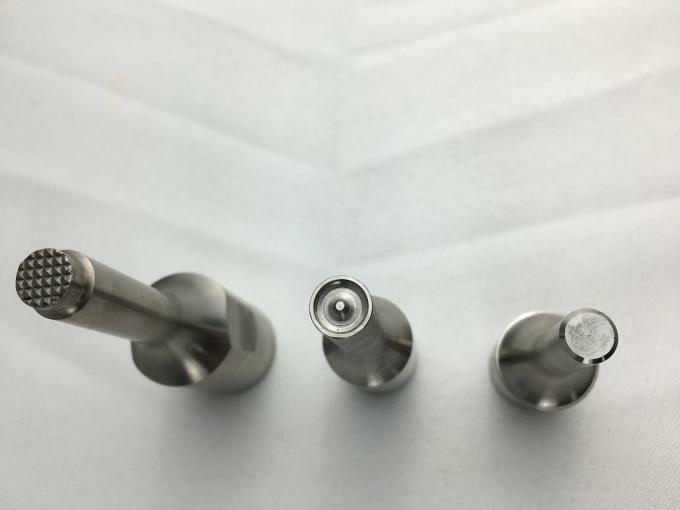 The principle of ultrasonic plastic welding is to produce 35KHZ high frequency signal and energy exchange system by generator, and convert the signal into high frequency mechanical vibration. The temperature of the interface is raised by the friction between the surface of the workpiece and the inner molecules.When the temperature reaches the melting point of the workpiece itself, the workpiece interface will melt quickly, and then fill the gap between the interfaces. When the vibration stops, the workpiece will be cooled and fixed at a certain pressure, and then the welding will be achieved. Automobile sound insulation cotton is an important direction of automobile noise control. The sound-absorbing cotton is placed on the A-pillar guard plate, the B-pillar guard plate, the door panel guard plate, the middle passage, the wheel cover guard plate, the spare tire cover plate, the trunk, the engine cover, Car interior and exterior trim such as car main carpet. 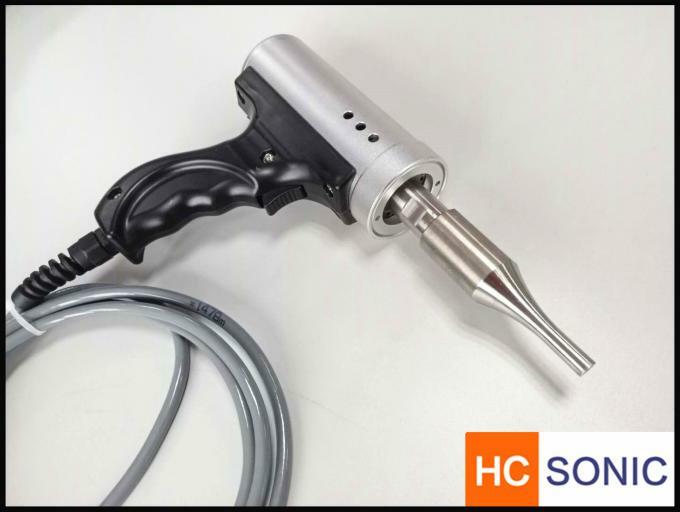 The connection between the sound-insulating cotton/sound-absorbing cotton and the plastic product is replaced by an ultrasonic welding process. 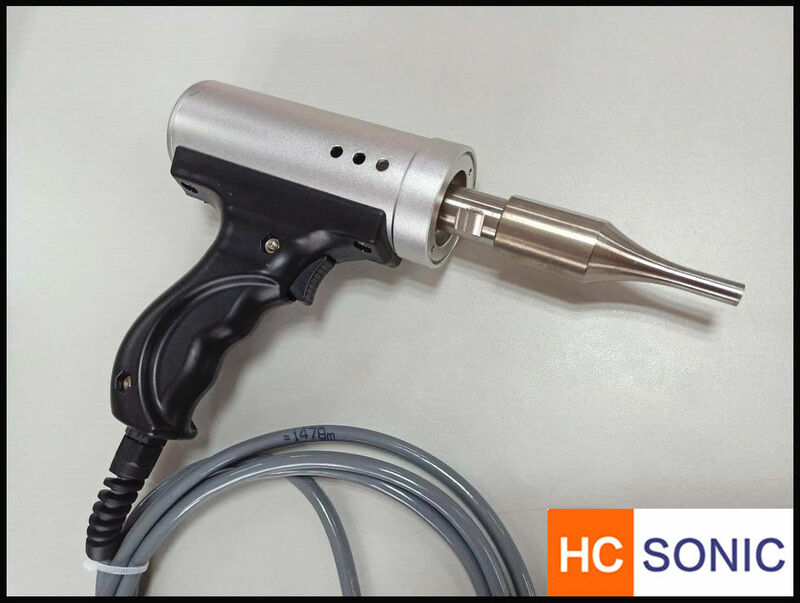 Automotive sound insulation cotton / sound-absorbing cotton ultrasonic welding process has hand-held ultrasonic spot welding, sound insulation cotton professional welding equipment and robotic automated ultrasonic welding equipment. Automobile sound insulation cotton includes sound insulation damping rubber, silencer insulation cotton, hood insulation pad, automobile sealing strip, wheel arc lining and so on. The ultrasonic hand press offers a cost effective alternative to a standard pneumatic bench press. It is ideal for low volume production, offering an advantage over a hand held welder with its rigidly fixed welding head. The weld depth can be set giving consistent, repeatable results. 1.One key start, simple operation and easy to start with for customers. 2.Imported CPU and drive unit to ensure reliable power supply. 3.Effectively balance the amplitude while frequency is locked based on the frequency and amplitude control using PID. 4.Power outburst mode, save energy comparing to the traditional ultrasonic hand-held welding machine. 5.Welding amplitude adjustable from 60% to 100% by 1% step. 6.Dual-frequency mode, one can easily switch from one frequency converter to another by software configuration, the frequency setting range is ±8K. The welding horn is customized, so we need to keep in touch with you. 1. Automatic frequency chasing: Automatically detects the welding data of the machine and the mold, and stores the welding frequency. 2, intelligent protection: power overload, equipment temperature is too high, frequency deviation is too large, the load connection line is not strong, the welding head is damaged, the current is too high and so on. 3, power-on self-test: power on self-test and make relevant tips, prevent bad, and convenient maintenance. 4, the amplitude is adjustable: the amplitude of the amplitude can be adjusted at any time during the welding process, from 5% to 95%, accurate to 1%. The size of the plastic parts can be perfectly welded, effectively reducing the wearing, burns and other defective products.